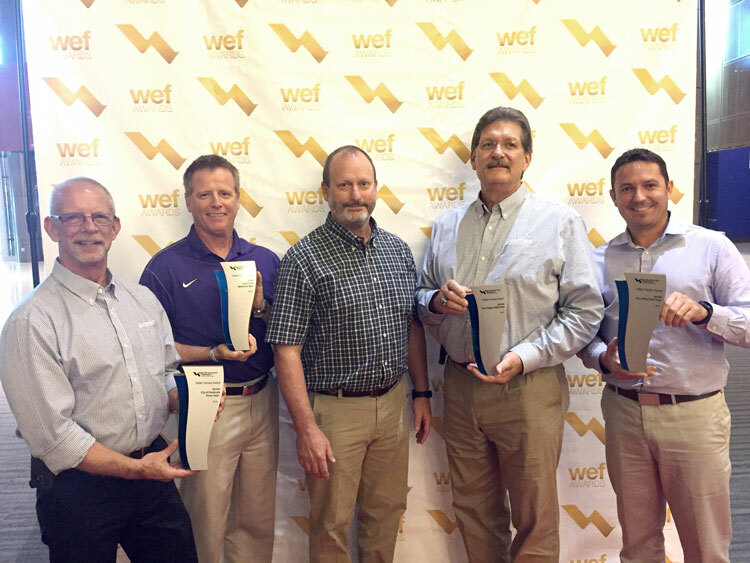 Jacobs project staff and client representatives received the awards at WEFTEC 2018. Left to Right: Pembroke Pines Project Manager Dan Stark, West Melbourne Project Manager Brian Mascher, City of Pembroke Pines Utility Director Riley Smith, The Villages Project Manager Rock Raiford and City of Key West Utility Director John Paul Castro. Dallas — The Water Environment Federation (WEF) honored Jacobs Engineering Group Inc. with the 2018 Water Heroes Award, which recognizes individuals and organizations that have performed above and beyond the call of duty during an emergency situation to continue protecting the public and the environment. Four Florida-based Jacobs Operations Management project teams, including The Villages, Key West, West Melbourne and Pembroke Pines, were recognized for their ongoing efforts during the most expensive and destructive U.S. hurricane season on record. Staff members and leaders at the four project sites operate and maintain water and wastewater utility systems that serve more than 345,000 residents. The Jacobs-operated facilities were in the path of destruction during the 2017 hurricane season. More than 230 Jacobs staff collaborated and shared skills and resources state-wide to prepare and respond to the events. The staff lived and worked at the project sites voluntarily throughout the storms to ensure the water and wastewater facilities remained up and running. The project teams made extensive pre-storm preparations to prevent issues like facility overflows and speed the return of facilities to regular service soon after the storms passed. The annual Water Heroes Award was presented to Jacobs at the Water Environment Federation’s 91st Annual Technical Exhibition and Conference in New Orleans. The Water Environment Federation is a not-for-profit association that provides technical education and training for water quality professions who clean water and return it safely to the environment. Jacobs also sponsored the Operations Challenge at WEFTEC 2018, reaffirming its position as a leader in the operations and maintenance of wastewater facilities worldwide. Jacobs is a long-time sponsor of the annual challenge, which is a platform for top wastewater collection and treatment personnel to display their skills. The Operations Challenge events are designed to test the diverse skills required for the operation and maintenance of wastewater treatment facilities, their collection systems and laboratories.